Progressive Charlestown: The best way to improve Americans' life expectancy isn't some fad diet. The best way to improve Americans' life expectancy isn't some fad diet. You’ve heard, no doubt, of the miraculous Mediterranean diet, which is said to keep Italians and Greeks living healthy lives into their 80s and beyond. The Japanese diet is popular, too, as the Japanese live the longest lives in the world. Then there’s the Nordic diet, full of fish and dairy, that helps make longevity in Sweden and Norway among the longest in the world. Countless studies have tried to identify the critical ingredients in these diets. Should we eat grilled squid like the Greeks? Or more lingonberries like the Swedes? But the closer you look at the link between specific diets and health, the fuzzier the link becomes. The French live some of the longest lives on earth. The oldest known person was Jeanne Calment, a French woman who lived to 122 (and a half). And yet the French diet has become known as “the French paradox,” because it’s suspiciously high in saturated fat. The diet-focused answer? The red wine must protect them! Other countries, like Germany and Canada, have long lifespans, yet no one puts schnitzel and poutine on our list of health foods. What if the apparent link between a country’s diet and its health is an illusion? One reason that people leap from longevity to diet is a mental quirk known as the “you are what you eat” fallacy. Psychologists have found that people assume that the properties of food are transferred to those who eat it. In some parts of Asia, for example, tiger penises are eaten to increase men’s virility. But it’s not specific to Asia. American college students show a similar superstition. In one study, students learned about the cultural practices of two tribes. One was said to eat wild boars, whereas the other ate turtles. When the students were asked to describe the members of each tribe, they said the boar eaters were bearded and aggressive, and the turtle eaters were good swimmers with long lifespans. The leap from healthy lives to healthy-seeming foods might just be the same error. Medical evidence suggests that differences in lifespans across countries are better explained by social conditions than diet. 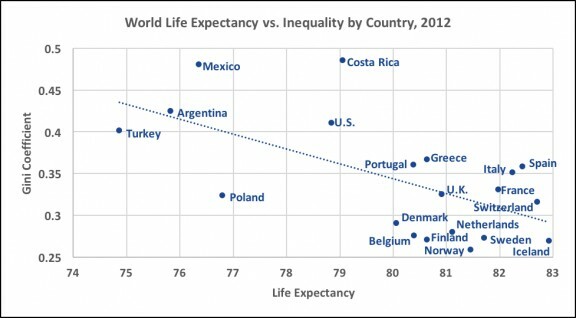 Researchers have found that among economically developed countries, income inequality is a major predictor of longevity. In fact, the most equal nations are Japan, Sweden, and Norway, which also have the longest life spans. Not far behind are Mediterranean nations including Spain, Greece, and Italy. It’s no coincidence that all these highly equal countries have inspired fad diets. If social equality is really the active ingredient keeping people healthy in these countries, then other mysteries start to make sense. Germany and Canada have low inequality and accordingly, long lives. France is no longer a paradox: Their low inequality explains their longevity. The Bordeaux might have nothing to do with it. At the bottom of the longevity list are high-inequality counties like the United States. Despite being among the wealthiest countries on earth, American life expectancy lags behind those of poorer, but more equal, countries like Ireland and Greece. The biggest health advances of the 20th century — antibiotics, sanitation, vaccines — were biological. The biggest public health insights of this century, in contrast, are social. Societies that allow extreme inequality to shred the social fabric pay the price in illness, unhappiness, and mortality. American life expectancy decreased last year for the first time in decades. The best way to reverse that decline isn’t diet plans, but economic policies that reduce inequality. Fresh fish and olive oil are nearly miraculous gifts. But if you want to live longer, my bet is on a living wage and affordable health care. Keith Payne, Ph.D., is a professor of Psychology and Neuroscience at the University of North Carolina and author of The Broken Ladder: How Inequality Affects the Way We Think, Live, and Die. Distributed by OtherWords.org.